THE ANCHOR GROUP SAYS FAREWELL TO CIIE2018 AND HELLO TO CIIE2019 AND THANKS ITS SUPPORT TEAM. The Anchor Group has successfully completed its presence at the 1st China International Import Expo, held in the National Convention & Exhibition Centre from 5 to 10 November 2018. “It took a full year of preparations”, explained Ivan Hiel, President of The Anchor Group, “but all efforts were worth it. We are very proud to have been part of the 1st edition and be amongst the 3.000 companies to have participated”. “It was a huge success and we achieved all the goals set-out at the start”, comments Yannick Kalantarian. “We could not have done this without the help of our support team and Ivan and I wish to thank each of them for their valuable contribution to its success”. The support team was composed of Mrs. Lian Lian Cai, representative of The Anchor Group in Shanghai, Mr. Davy Wauters, Managing Director of W Enterprises and representative of The Anchor Group for governmental affairs, Mr. Etienne Denil, Managing Director of EDN Consult and representative of The Anchor Group for Travel and Mrs. Dominique André. 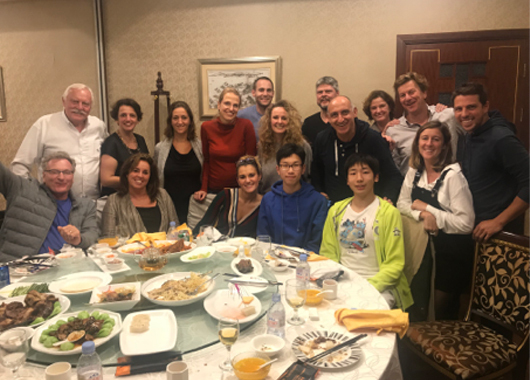 The representatives of the various participating companies and the support team were invited to a traditional Chinese dinner to say goodbye to CIIE2018 and to discuss already the participation for CIIE2019. See you all next year for the 2nd edition of CIIE.